JayMagee.com » Have Things Really Gotten This Bad In Our Public Schools? Have Things Really Gotten This Bad In Our Public Schools? 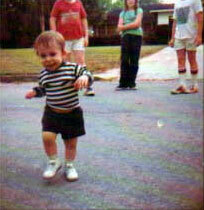 Although it has little to do with the story at hand, this is evidence that I did have some athletic moves as a wee lad. Today, like most Sundays, I volunteered as a reader and board operator for the WJCT Radio Reading Service. I’m borderline-ashamed to admit it, but it’s usually the only time each week that I look at a printed, physical newspaper. That is, unless you count the Florida Times-Unions deposited in the break room at work, which I liberally peruse while my Lean Cuisine du jour crackles in the microwave. As usual, I digress. But today, a story I read on the front page astounded me and made me mad. Those of you who know me well know it takes a lot to rile this old boy’s feathers, but this one made me darn-near incredulous. If you decided not to click this link, here’s what we in the public relations business call the “news peg.” The Duval County Public Schools are $97 million in the hole. They’re reeling from three straight years of budget cuts. Our new governor, Mr. Scott, is the reincarnation of that Crazy Eddie TV pitchman from back in the day and all about “slaaasshhhinnnnnggggg budgets!” And while the legislative decision is still a few weeks away, it’s looking pretty certain that to appease Tallahassee and keep the lights on at the public schools next year, Duval’s muckety-mucks will kill the lights Friday nights at area football stadiums in the fall. So there you have it: Scholastic athletics in Duval will roast as the sacrificial lamb. Football, basketball, cheerleading, band … gone? Yeah. And apparently Duval is the only county in the state considering such draconian measures. Before the real ranting begins, two disclaimers are necessary. For a variety of reasons, I never played formal scholastic sports as a kid. But frankly, it’s one of my biggest regrets as a fitness-loving adult today. And until I set foot on the University of Florida in August 1993, I never attended public school a day of my life. Am I qualified to rant? Maybe not, but this is my blog and I don’t care. I may have never been the gifted athlete that so many of us took such pride watching from the sidelines so many years ago. Perhaps you were one of those gifted athletes, or have a child or children today who are happily chipping away at Malcolm Gladwell’s purported 10,000-hour requirement to be a “professional” at anything. But there is no doubt that athletics, and the process of being an athlete or teammate, offers up lessons that just can’t be wrestled into the classroom (sorry, wrestling–aka: sitting on people–was the only thing I seemed to do half-way decently in high school, so I had to work it in). You learn to work together for a common cause, work hard to see your dreams through, process the agony of rejection and defeat and pick yourself up to battle another day. Some students who eschew books, but who have talents we have to recognize and celebrate, gain discipline and self-respect only on the field of play, and with coaches who mentor them into productive members of society. How, then, does sports fall outside the “core curriculum” our educators have neatly defined … probably in some old, dust-covered textbook about “best practices” in educational models? And think about all of those students who have a chance to progress into collegiate glory … and more importantly, academic scholarships that will pave the way to a life after sports. Where do they go now? Will Bolles, Bishop Kenny, Episcopal or the Day School du jour scoop them up? That’s a pipe dream and an influx of kids that the private sector can’t absorb. And shouldn’t have to. How many more Tim Tebows are out there who don’t have the resources Mr. Bronco had at Nease? As with any rant, the ranter must find fault with someone to gain a sense of justice. In this case, I just don’t know where to point my finger (guess which one?). Is it at the Gov, who seems to hold nothing sacred unless it’s a for-profit job incubator that will allow him to find his campaign-promised 700,000 new jobs? Or is it at the Duval school district, which arguably hasn’t moved on a number of initiatives to take a machete to budgetary fat? So the jury’s out on who to blame. Who can fix this mess? Who will step up and find an innovative solution to keep the lights on Friday nights? Or will this just be another excuse for urban flight and into the more affluent (and arguably better-managed) outlying counties’ school districts? Clay and St. Johns, I hope you guys are ready. I don’t have a solution here. Do you? How about each teacher instead give $50 a month from his or her union dues to help pay for their health care (which is currently free to them). There is your 7 million right there. P.S. Each Duval County teacher pays $920 per year to the 2 unions that them must belong to.